So here’s a thing. A thing called DungeonScript, which you can find right here. 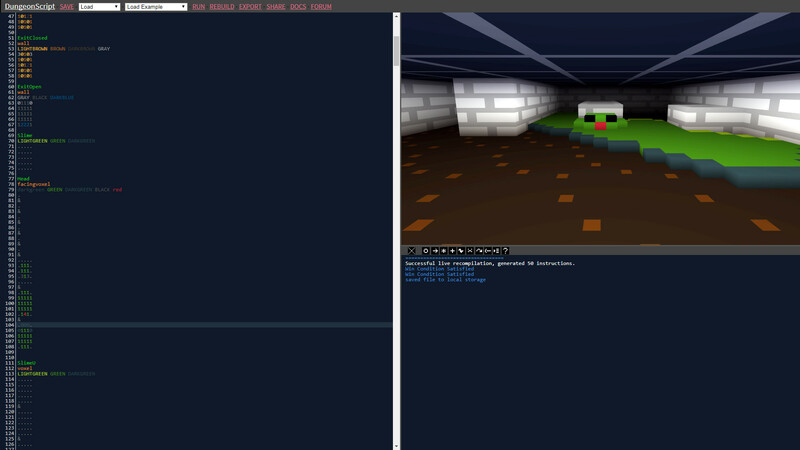 You can use it to make games, or play games, like this new 3D edition of Dungeon Janitor. Go! Enjoy! The other day Blue Manchu’s Jon mentioned he wouldn’t know where to start designing a Dungeon Master style game. That got me wondering how I’d start designing a Dungeon Master style game, and what tools I’d use. Immediately I thought of increpare’s very wonderful PuzzleScript, which is great for turn and grid based puzzle game development, but, like, in first person. That’d be really cool, I thought. If only PuzzleScript would draw in first person. So that’s what DungeonScript is. It’s PuzzleScript in first person. What’s most wonderful about PuzzleScript, and therefore also DungeonScript, is that you can build and share an entire game using just the editor webpage screenshotted above. Everything from the art to the audio to the game logic sits in one simple text file, and there’s a share button right there on the screen. Some fantastic games have come out of PuzzleScript, and I’m hoping people will use DungeonScript to create crazy new worlds for us to explore. So… hop in! Have a play. I’d love to see what you come up with. PS: Here’s a link to the DungeonScript source, in case you’re into that sort of thing. You won’t need this if you’re just making games with it though. PPS: If you grabbed the source just after I posted this you might want to try again to get version 1.1. 1.0 didn’t work in firefox or safari. Erp. PPPS: If you grabbed the source before version 1.2 you might want to try again – I just fixed a bug with checkpoints (October 2017). PPPPS: So… 1.2.1 is better. I forgot to add that fix to the export code. (October 2017). Captain Bim on Shields Up!